Step 1 Grease an oven safe baking dish (a pie or tart pan works great here) and turn the oven to 350F. Step 2 In a bowl whisk together all the ingredients and pour them into the greased baking dish. Bake for approx. 20 minutes–or when you gently agitate the dish, the center doesn’t jiggle. Rubbery, over cooked, leathery eggs are not tasty eats. 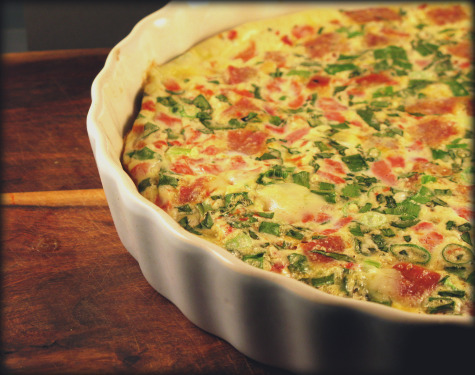 There are 2 secrets to a great frittata. 1. Use a dish that’s wide enough! The smaller the diameter of the dish, the longer the eggs take to cook–hence the leathery-ness and browning. Notice in the pic that the eggs come about half way up the dish. You’ll never guess #2. 2. Acid. Vinegar, lemon juice, salt, etc. Acids actually tenderize the proteins in the eggs, so the end result is lighter and creamier…and NO, you don’t taste the acid in the finished eggs. Minus bacon for me, but delicious! Easy and fast to prepare and oh so yummi!